Many of us creative types wish to not be bothered with anything but our craft, especially when a deadline is approaching. But as your electric company has probably conveyed to you, creative types aren’t exempt from pesky little tasks like paying bills, and the IRS doesn’t excuse us from keeping up with our receipts and paperwork either. Much the same, our publishers need their right-brained authors to tap into that left hemisphere on occasion. Last week, my co-author/mom and I worked on our publisher’s Advanced Sales and Marketing Information (ASMI), which included compiling a list of influencers that should receive a copy of the book. Our book deadline is still three months away and it won’t be on the shelves for another year. As a newbie author I didn’t know to plan for this project and my experienced co-author was surprised at how early it was being requested. It seems we authors have driven our publishers to request the information earlier and earlier. If you’ve thought ahead and kept good records, the gathering of information will not be a big deal. Then, you can focus on the fun part of the ASMI, the description of your book, the key takeaways, the reason you’re writing it and so on. If you haven’t kept good records, though, you will likely spend days tracking down addresses and contacts, finding the best full service moving rates at http://www.fullservicemovers.biz/ and racking your brain to remember the name of the church where you spoke in the Fall of 2005 and what the call letters are for that radio station in Milwaukee that interviewed you last spring. A list of names, professional titles, and addresses of 50 influential people who can be counted on to help promote your book. As someone who has done this legwork for self-published authors, I can say that you really want to take advantage of this offer. It’s a lot of work and expensive to package and mail 50 or more books. Your publisher is offering, but you need the connections and their contact information. In the day of email and Facebook, unless you run a business, it’s rare to exchange physical addresses. I suggest, as you meet potential influencers, to tell them you are writing a book and would love their address so you can have a copy sent to them when it comes out (you don’t have to have a contract to use this line). When you get an address, quickly add it to your online contact database and tag the person as a potential influencer. 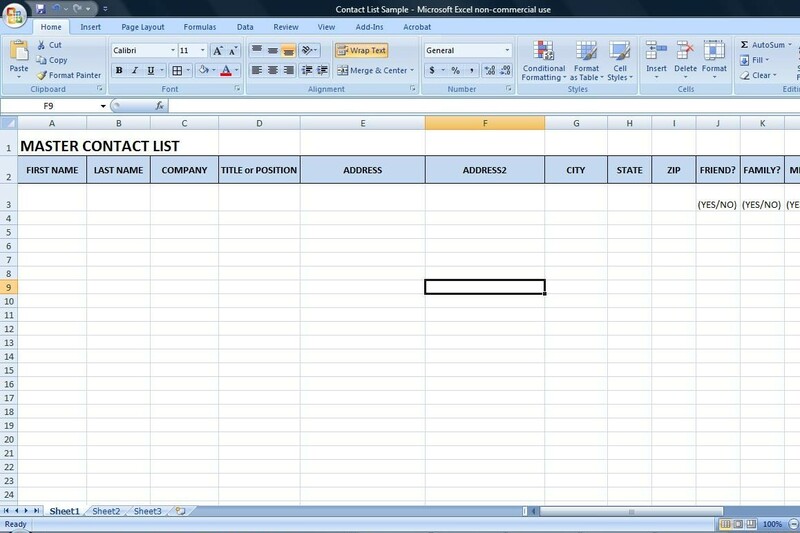 Excel is an excellent and easy place to track contacts. Here’s a sample contact form you’re welcome to use. 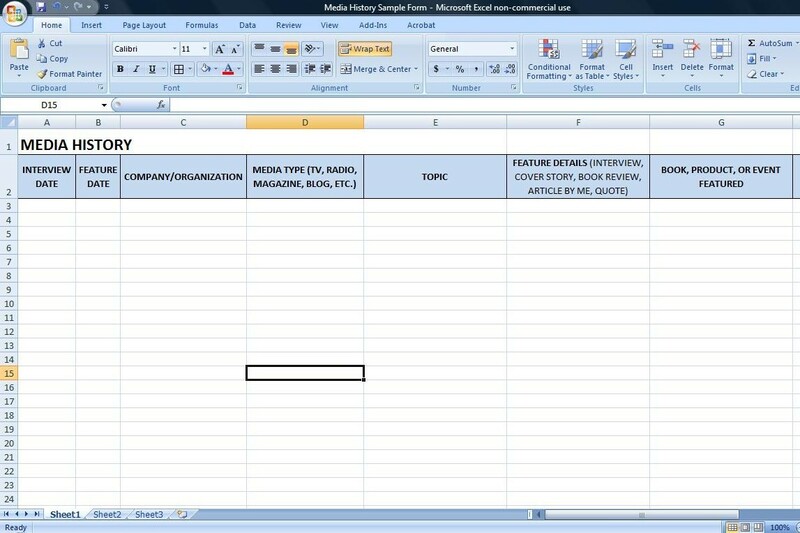 A simple excel spreadsheet can help authors keep track of friends, family, potential endorsers, and media all in one place. Download a copy in the link below. A list of prominent people from whom we should request an endorsement. If you are lucky or have put in the time to network with other authors or experts in your field, you might know a few prominent people who would gladly write an endorsement for you. Even if you don’t know a person, if they would be a perfect endorser for your book and you can get their address, include them. You may be surprised who will say yes. One of my self-publishing clients requested an endorsement from Olivia-Newton John on her book Alphatudes: the Alphabet of Gratitude. Instead of an endorsement, Olivia ended up offering a free download of her song “Grace and Gratitude” with the purchase of the book. Start a contact record for any potential endorser now or when you are researching competition for your proposal. Those “competitors” may be perfect people to ask. A list of media you think should receive a copy of the book. Your publisher will have a set of media contacts that they already plan to send your book to, but you can’t rely on them to know every local or topic-specific outlet. The great news is they will ask you for your input on this, since you know your topic best. As you come across media outlets (blogs, magazines, newspapers, television shows) that would be perfect for your book, put their mailing information in your database. A list of your previous media and speaking history. For some, this may be a short and easy list. My writing and speaking career is just getting started, so I I’ve had very few media and speaking appearances, and even still, I almost forgot some of the details I needed. My mom, on the other hand, has been writing and speaking for almost two decades. Try remembering 20 years of speaking engagements and interviews for 40+ books. My suggestion is to keep one ongoing spreadsheet for speeches and one for media. Every time you finish an interview or publish an article, write down all the details. The name of your contact person, the host’s name, the topic, the date, etc. Put contact information in your contact database, though, not on these forms, so you only have to keep one record updated. Here are sample Speech and Media History forms you are free to use. Keeping track of all your speeches in one place will not only make it easier to fill out your ASMI, but will also give you a quick sortable history when you need a reference for a certain speaking topic or want to pitch something fresh to a previous client. Download a copy below to start keeping track of your speeches. As excited as you might be for your first few interviews, you’d be surprised how quickly you’ll forget which magazine interviewed you on what topic or which tv producer you worked with. 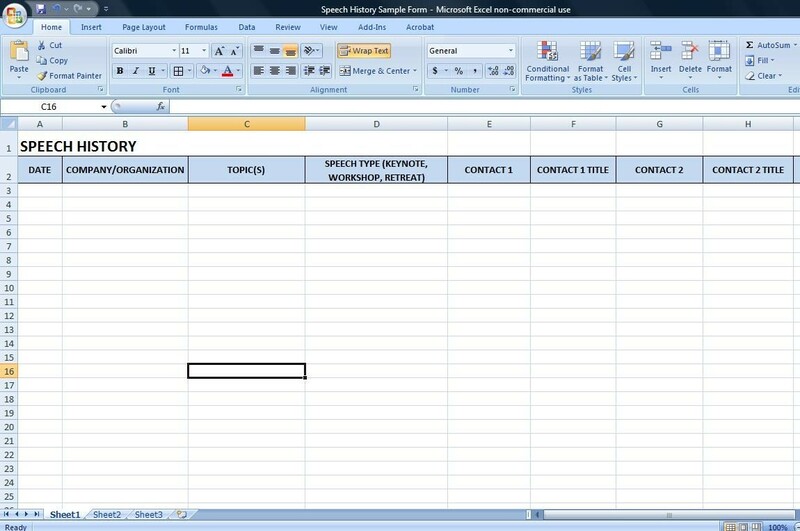 Keep it all in one place with an easy spreadsheet. Download a copy below. How do you keep track of your contacts, media, and speaking engagements? Any other tips or suggestions? This entry was posted in Marketing and Promotion, Publishing and tagged advanced sales and marketing, asmi, book influencers, contact database for writers, getting endorsements, Rachel Randolph, sample contact form, sample media history form for writers, sample speech history form, tracking speech history by Rachel Randolph. Bookmark the permalink. Rachel Randolph is co-author of the book and blog We Laugh, We Cry, We Cook with her mom Becky Johnson. She lives near Dallas with her husband Jared and their toddler. Shocking their meat-lovin’ families, the couple decided to give up meat, dairy, and eggs in 2010. Rachel’s passion for cooking ignited as she set out to make vegan food taste delicious. She and Becky share a food blog (www.welaughwecrywecook.com), where vegans and omnivores are both welcome at the table, and laughter and love are the key ingredients to every dish. Thank you so much for this! Much appreciated! Rachel, this is SO unbelievably helpful! Thanks! Will be using these tools. Gillian and Martha, I’m SO glad this is helpful! Thank you for your comments. Awesome! Thanks for the downloads, Rachel! It’s great to see how others writers organize some of their data. And this also helps me to know more of the info that I need to be compiling before I publish a book. I can see how this process can save time and energy later. Again, thanks a million! Very helpful, Rachel. I have a hubby who’s organized, but I’m not, by nature. These tools are great. Thanks so much! Rachel, thank you for this info. If I have a weakness in this business, this is it! The downloads are very helpful. Thanks for a very helpful post, The downloads are very handy as is the encouragement to be organized.